Square profile balustrade posts, designed to make a statement. Available in 304 or 316 grade stainless steel in 40mm square section. 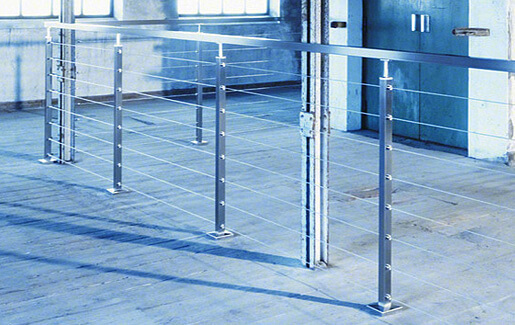 This range of square profile stainless steel balustrade posts are available in either 304 (interior) grade or 316 (exterior) grade stainless steel. All with a satin finish and engineered to work with all the other square line system components and fittings. Each square post is supplied with a pre-welded base plate in position and an open top for you to add a post fitting. Simply add "Square" balustrade components to complete your balustrade, whether it be Tube End Caps, Handrail Saddles, Tube Mounting Adapters, Tube Connectors or Post Base Plate Cover. We manufacture these balustrade posts to order. If you need different heights, numbers of holes or spacings please contact us on 01302 752 504 or email us for further information. 60x30 Profile Posts Make a stylish design statement.